Buena, aunque mejorable el bufete del restaurante. 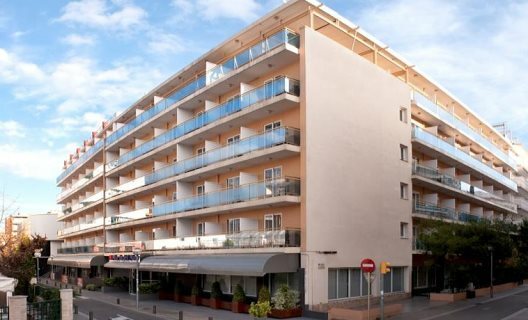 This welcoming beach hotel is situated in the bustling tourist area of Lloret de Mar. The hotel is idyllically located just 300 metres away and guests will find themselves within easy access of the abundance of restaurants, shops and entertainment venues that the resort town has to offer. This charming hotel greets guests with warm hospitality and peaceful surroundings. The guest rooms are tastefully decorated and come complete with modern amenities for visitors' convenience. They offer the ideal setting in which to relax and unwind in comfort at the end of the day. The hotel affords guests access to a selection of excellent recreational and leisure facilities for their convenience. Type: Hotel, Hotels With Charm. Room size (sqm): 12, Bathroom, Free WiFi, Direct dial telephone, Central heating, Balcony, Extra beds on demand, Cot on demand. Check in:13:00 hrs. 22:00 hrs. Check out:10:00 hrs. 10:30 hrs.